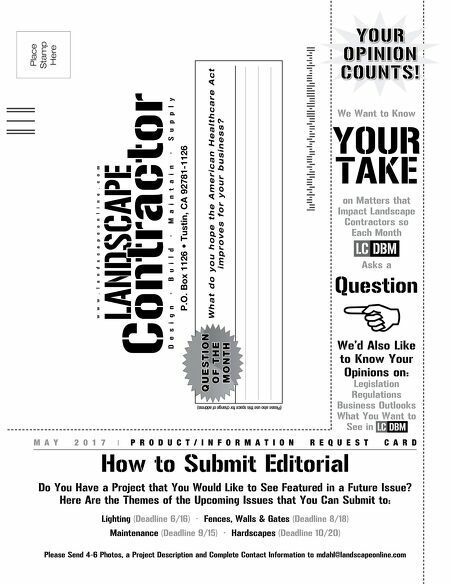 May 2017 5 2017 LC DBM Buyer's Guide Landscape Contractor / Design • Build • Maintain (LC/DBM) (ISSN 2150-9093), is published monthly by Landscape Communications, Inc. 14771 Plaza Drive, Suite A, Tustin, California, 92780 Phone: 714-979-5276; Fax: 714-434-3862. Online version (ISSN 2150-9170). Copyright 20 17 by Landscape Communications, Inc. Printed in the U.S.A. All rights reserved. Contents may not be reprinted or otherwise reproduced without written permission. Periodicals postage paid at Tustin, CA and additional mailing offices. Subscription Inquiries: Send new or renewal notices or change of address (send both new and old addresses to Landscape Contractor / Design • Build • Maintain, P.O. Box 1126, Tustin, CA 92781-1126. Subscriptions: Licensed Landscape Contractors free of charge. Others: Continental U.S., Alaska, Hawaii & Canada, 12 issues, $34.95, 24 issues, $55.00, Mexico: 12 issues, $65 per year. Additional copies may be purchased by contacting LC/DBM at circulation@landscapeonline.com or 714-979-5276 ext. 115. Postmaster: Please send address changes to Landscape Contractor / Design • Build • Maintain, P.O. Box 1126, Tustin, CA 92781-1126. 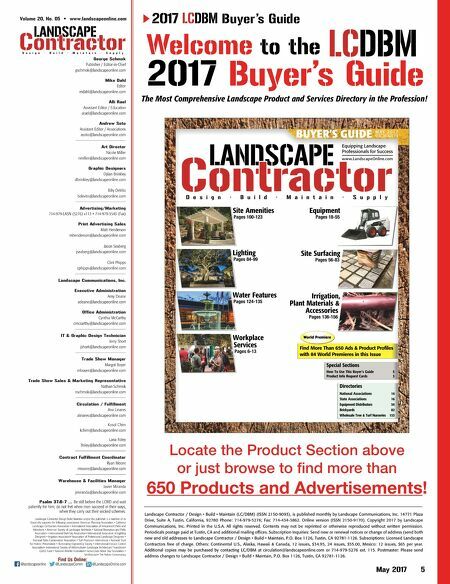 Welcome to the LC DBM 2017 Buyer's Guide The Most Comprehensive Landscape Product and Services Directory in the Profession! Find Us Online: @LandscapeComm @landscapeonline @LandscapeOnline.com George Schmok Publisher / Editor-in-Chief gschmok@landscapeonline.com Mike Dahl Editor mdahl@landscapeonline.com Alli Rael Assistant Editor / Education arael@landscapeonline.com Andrew Soto Assistant Editor / Associations asoto@landscapeonline.com Art Director Nicole Miller nmiller@landscapeonline.com Graphic Designers Dylan Brinkley dbrinkley@landscapeonline.com Billy DeVito bdevito@landscapeonline.com Advertising/Marketing 714-979-LASN (5276) x113 • 714-979-3543 (Fax) Print Advertising Sales Matt Henderson mhenderson@landscapeonline.com Jason Seaberg jseaberg@landscapeonline.com Clint Phipps cphipps@landscapeonline.com Landscape Communications, Inc. Executive Administration Amy Deane adeane@landscapeonline.com Office Administration Cynthia McCarthy cmccarthy@landscapeonline.com IT & Graphic Design Technician Jerry Short jshort@landscapeonline.com Trade Show Manager Margot Boyer mboyer@landscapeonline.com Trade Show Sales & Marketing Representative Nathan Schmok nschmok@landscapeonline.com Circulation / Fulfillment Ana Linares alinares@landscapeonline.com Kosol Chim kchim@landscapeonline.com Lana Foley lfoley@landscapeonline.com Contract Fulfillment Coordinator Ryan Moore rmoore@landscapeonline.com Warehouse & Facilities Manager Javier Miranda jmiranda@landscapeonline.com Volume 20, No. 05 • www.landscapeonline.com Psalm 37:6-7 … Be still before the LORD and wait patiently for him; do not fret when men succeed in their ways, when they carry out their wicked schemes. Landscape Contractor Design Build Maintain and/or the publisher is a member of or financially supports the following associations: American Planning Association • California Landscape Contractors Association • International Association of Amusement Parks and Attractions • American Society of Landscape Architects • National Recreation and Parks Association • International Dark Sky Association• International Association of Lighting Designers • Irrigation Association• Association of Professional Landscape Designers • National Parks Conservation Association • Turf Producers International • National Trust for Historic Preservation • Illuminating Engineering Society • International Erosion Control Association• International Society of Arboriculture• Landscape Architecture Foundation• CLASS Fund • National Wildlife Federation• Sierra Club• Arbor Day Foundation • Smithsonian• The Nature Conservancy BUYER'S GUIDE M AY 2017 VOL.20-NO.05 Site Amenities Pages 100-123 Lighting Pages 84-99 Water Features Pages 124-135 Workplace Services Pages 6-13 Equipment Pages 18-55 Site Surfacing Pages 56-83 Irrigation, Plant Materials & Accessories Pages 136-156 World Premiere Find More Than 650 Ads & Product Profiles with 84 World Premieres in this Issue Special Sections How To Use This Buyer's Guide 5 Product Info Request Cards 3 Directories National Associations 14 State Associations 16 Equipment Distributors 54 Brickyards 82 Wholesale Tree & Turf Nurseries 153 Locate the Product Section above or just browse to find more than 650 Products and Advertisements!